Picture framing plates for screwing picture frames securely onto a wall. Two screws go into the back of the frame moulding & one goes into the wall. 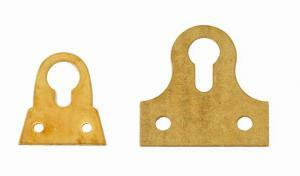 This version has a “reverse slot” or Keyhole & is made from brass. They are often used where health & safety is a concern as it stops the frame from falling off the wall & breaking the glass ­ hence the name. GP2321/1 takes category 3 screws. GP2321/2 takes category 5 screws.